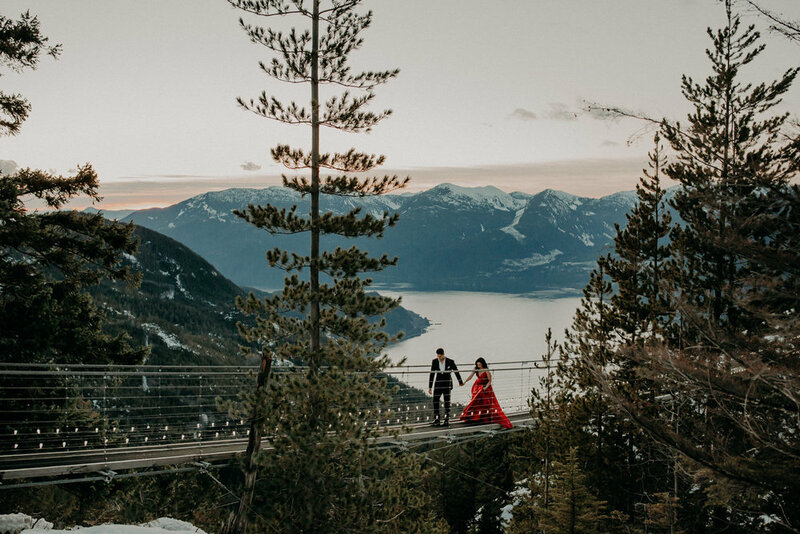 The Sea to Sky Gondola (in Squamish, BC) is one of the most stunning spots around the Greater Vancouver area, and perfect for breath-taking engagement or wedding portraits. Being beautiful in nature also means that tourists from both near and far come to enjoy the mountain views, hikes, and even restaurant dining. No matter the season, this place is one of my favourite recommendations for those visiting Vancouver. Unlike it’s neighbour, The Chief, it provides the same stunning views with very little effort. It is no wonder that for this session, everyone had the same idea in mind as to how to spend a sunny December evening, and thus it was very crowded. I feel proud that these photos look like we were the only people on the mountain, but don’t be fooled, it required a lot of patience to make sure the coast was clear. Everyone was very gracious and we said many thank you’s to those around us who waited until we had taken the shot and moved out of the way. The real stars of the show were Rosy & Karin who looked absolutely amazing despite the chilly temperatures. You wouldn’t even know because of how happy and content they looked when they were focused on each other. These two met through mutual friends and after doing the dance of playing it tough, they were soon dating and in love. After being engaged for 2 years, they are finally tying the knot this summer, and I am so excited for them! 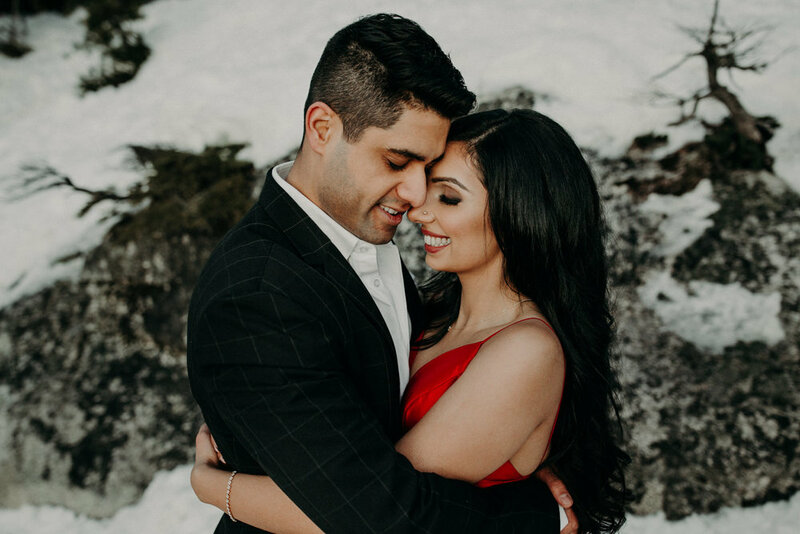 As a photographer, I am always up for enduring low temperatures and long distances for great pictures, and I am thankful that these two were up for the challenge. 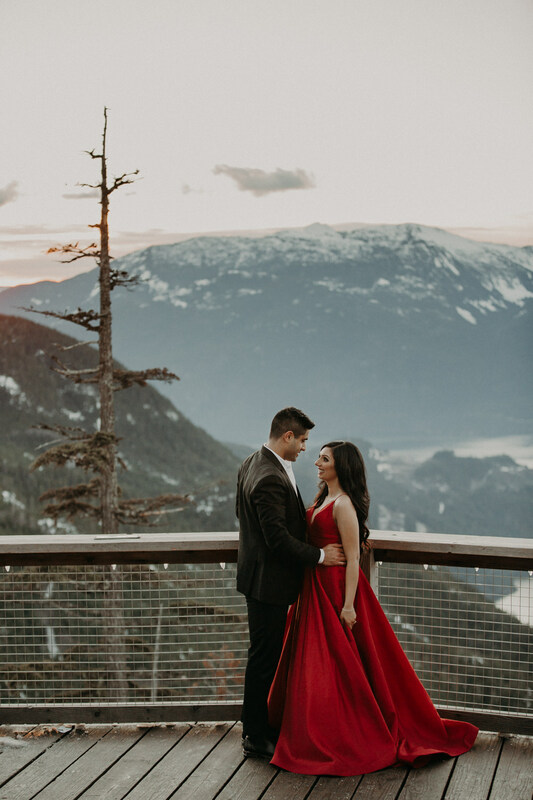 Rosy’s red dress and Karin’s impeccable style brings this session to a whole new level. Enjoy! 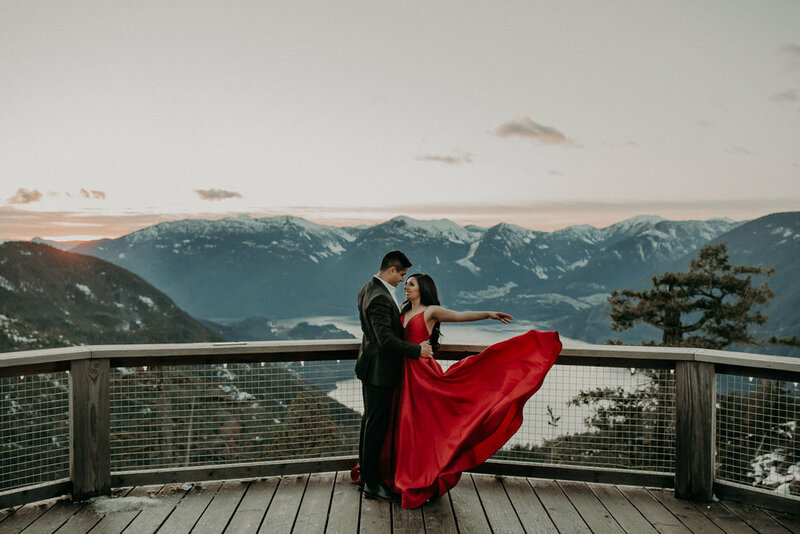 If you are interested in an engagement session at Sea to Sky Gondola in Squamish or any other location near Vancouver I would love to hear from you! Simply click here and fill out the contact form to get more information!